Thinking about pouring a concrete slab for a new backyard patio this spring? This is a great weekend project that you can tackle on your own with the right preparation. 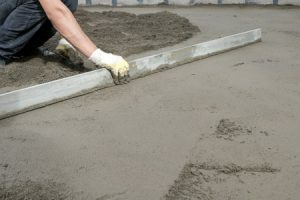 If you haven’t had much experience working with concrete in the past, however, there are a few common errors you should keep in mind to make sure you get a great finished product. Different applications call for different concrete mixes, so make sure you get the right ratio of cement, sand and course aggregate before you start pouring. Add water to the mix gradually to ensure the concrete doesn’t get thin and runny. Ideally, the wet concrete should be the consistency of a smooth, thick paste. Adding too much or too little water can ultimately compromise the strength of your concrete slab. To prevent cracking and crumbling, concrete patios need to be built on solid, well-drained soil. If you live in a region with lots of clay in the soil, you will need to dig down further and backfill with layers of compacted sand and gravel. If you’re lucky enough to have sandy soil in your yard, you can simply remove the grass and topsoil and pour a layer of gravel for extra drainage. Make sure the surface is firm and level before you start pouring concrete as well. Line the perimeter of your patio with braced wooden forms to ensure the concrete stays within the desired area. These forms also need to be carefully leveled to prevent concrete from spilling over one side or another. Taking time with your prep work can make the final installation much easier. Concrete is strong in many ways, but it lacks tensile strength which can make it vulnerable to cracking. To prevent cracks and make your patio as durable as possible, it’s a good idea to reinforce the slab with a steel mesh. This entails pouring about half of your concrete into the form, placing the pre-cut steel mesh and then pouring the rest of the concrete over the mesh. At Lawrence Tool Rental, our concrete buggies make it easy to move large volumes of concrete around your work site. Give us a call or contact us online to get the tools you need for your next DIY project today.